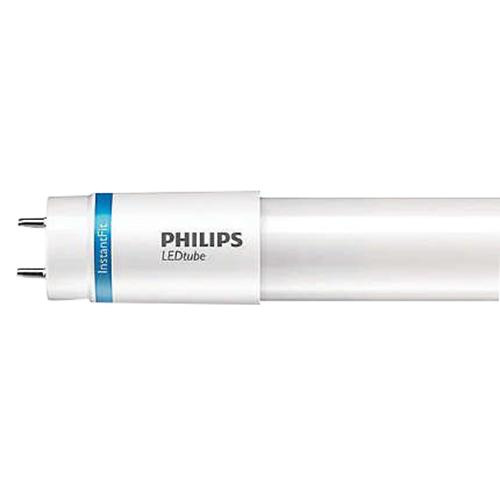 Philips Lighting Instantfit 15-Watt T8 G13 2-Pin base LED lamp offers 2100-Lumens of bright light output. This lamp has voltage rating of 120 - 277-Volts and has current rating of 110-Milli-Amps. It has color rendering index of 82. Lamp with 4000K color temperature rating radiates cool white light to the surrounding. It emits or distributes light at beam angle of 160-degree. It measures 48-Inch x 1-Inch Dia. This LED lamp has average life of 50000 hours. It is perfect for applications with frequent on/off switching cycles. This lamp fits into existing linear fixtures. It is idea for use in food areas and refrigerated food displays. Lamp is UL listed, CE marked, CSA certified and RoHS compliant.